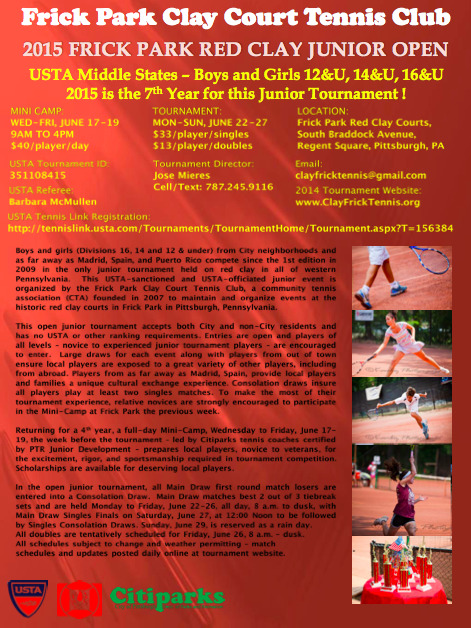 Frick Park Clay Courts Tennis Club - - Now in its 12th year! 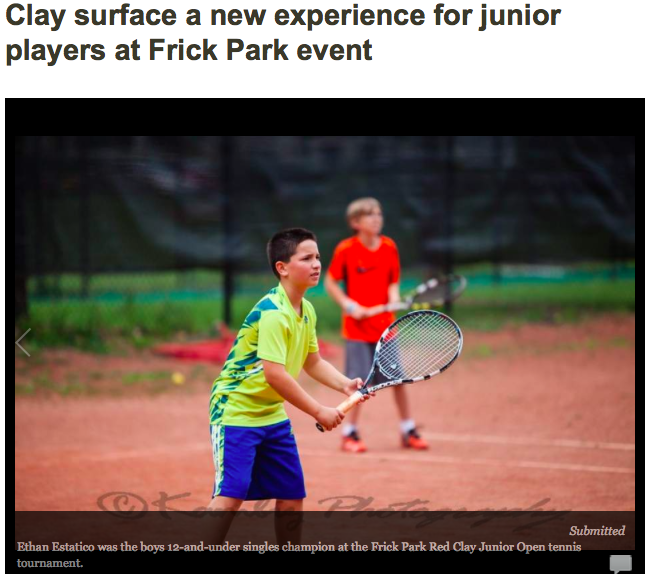 Welcome to the Frick Park Clay Court Tennis Club website. 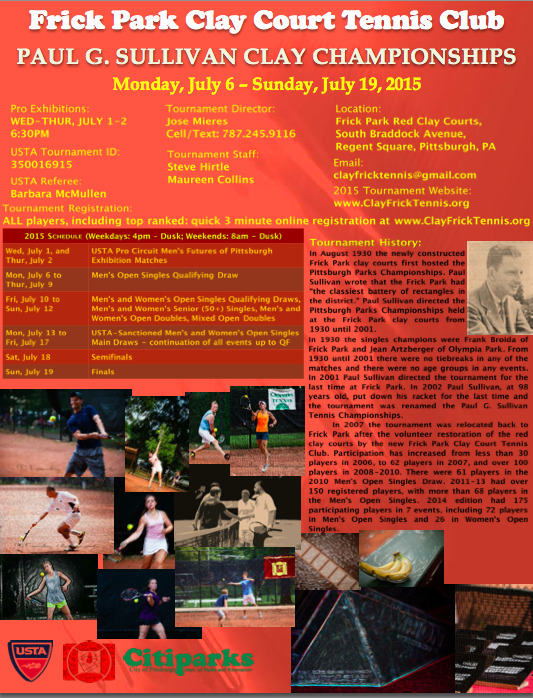 Our incorporated, non-profit and volunteer-based 501c4 organization was founded in June 2007 to restore and revitalize the historic red clay tennis courts in Frick Park, Pittsburgh, Pennsylvania, which first opened in 1930 and were among the first generation of public clay tennis courts in the US. Thanks to the invigorating hands-on volunteering and encouragement of many players and supporters in Pittsburgh and beyond, our efforts have been recognized with several awards: 2007 Community Tennis Association of the Year Award by the USTA Allegheny Mountain District, 2014 and most recently 2016 USTA Middle States Premier Provider, and the 2015 USTA Middle States Community Tennis Association of the Year. The Frick Park Clay Courts are of Citiparks Tennis, which oversees public tennis courts in over 50 of the Pittsburgh parks and playgrounds! As a recognized Community Tennis Association, FPCCTC works closely with Citiparks and collaborates with local community organizations to provide quality tennis programs for all ages and all levels of play, including free introductory clinics and community tennis events, weekly round robin play, junior and adult USTA-Sanctioned tournaments, after-school junior tennis, junior summer tennis camps, local and USTA Leagues tennis teams, and coach development workshops while maintaining the unique red clay courts for area residents and visitors from all over the world to enjoy. Since 2007, in addition to court surface restoration and seasonal and daily maintenance, many court improvements have included new permanent clay court "nail-less" lines, an electric cart to roll the courts and haul materials, new underground water lines, new fence and design, and a new exhibition court viewing area for the first time in the history of the courts. Court surface materials now include crushed red brick top dressing added to the existing red clay surface, as part of our ongoing Green Initiatives. All are welcome to watch and play tennis on Pittsburgh's historic red clay courts! See Twitter Feed in Right Column for Daily Updates ? ? ? 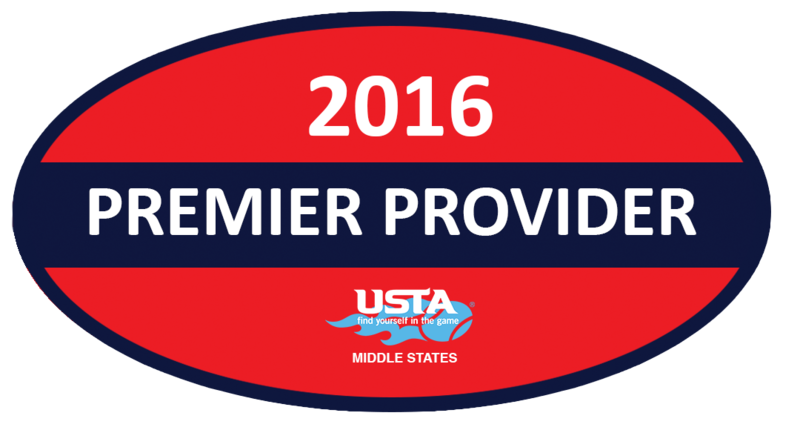 Separate Sessions for Novice to Advanced USTA Junior Tournament Players. All equipment including tennis racquets is provided. Flexible scheduling, Walk-in Registration Available! 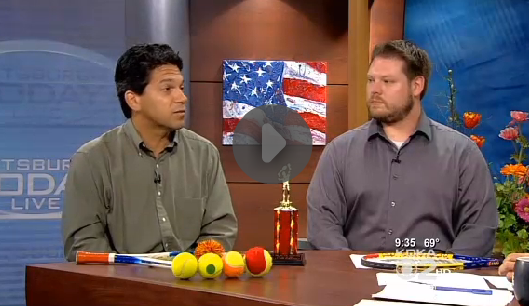 CLASSIC WOOD RACQUETS TOURNEY since 2008! 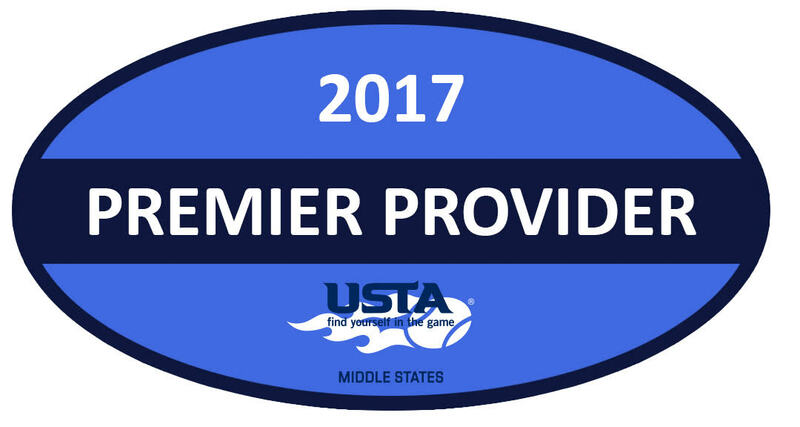 Frick Park Clay Court Tennis Club was named one of 15 Middle States Premier Providers for 2017 for the second year. More information about the 2016 award, at the NetPlay Magazine. 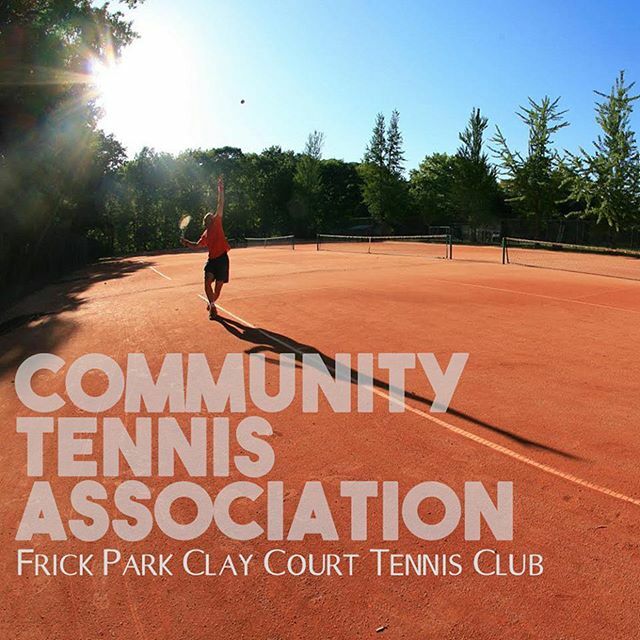 For its work in 2015, Frick Park Clay Court Tennis Club was named the Middle States Community Tennis Association of the Year!! Read more at the USTA Middle States Blog. 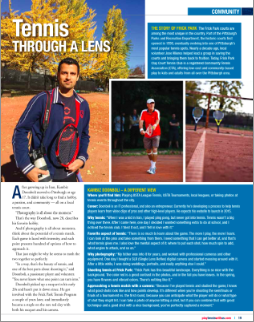 Cover of the Winter 2015 Netplay magazine, plus two additional articles, feature the Frick Park Clay Courts and the stunning photography of FPCCTC Board Member, Kambiz Doonboli. Read more at https://netplaymag.wordpress.com. 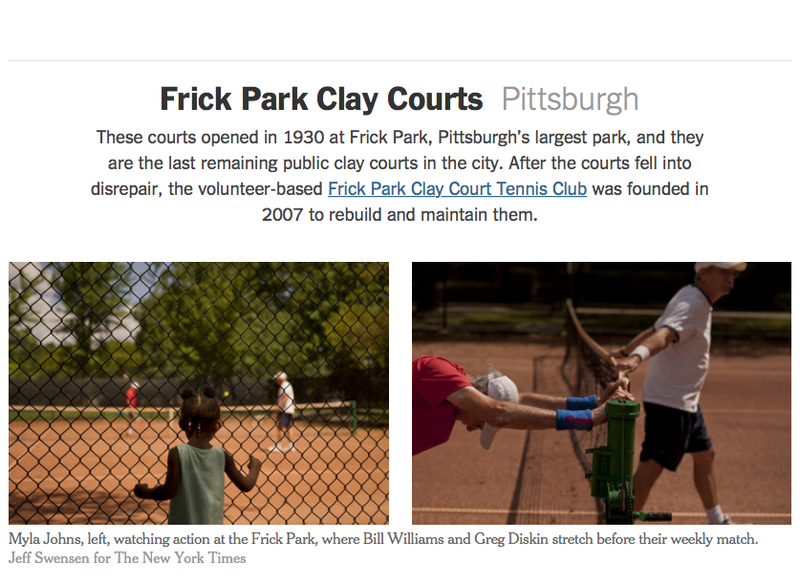 The historic Frick Park Clay Courts were featured in the New York Times August 2014 photo essay on Tennis, Anywhere. The article highighted just nine unusual or historic courts, among an estimated 250,000 tennis courts across the United States. Congratulations to Lukas Schimunek (2017 MOs Champion), Mary Wilson (2017 WOs Champion, and all the other champions and competitors! For inquires about the tournament and its history, please email Tournament Director Jose Mieres at redclayfrick@gmail.com. Details for all events above on the FPCCTC Junior Calendar! good character and passion of the people who play on them. We Thank All of Our Very Generous Sponsors! PNC, Dollar Bank, USTA Middle States, Babolat,	K	& L Gates LLP. Green: Documentation of how FPCCTC takes a Green approach on the Red Clay. Nice Shot! Lean in! On the strings! Close it up! Recover! Nice Clay Courts! Nice Playing with You!